Bitterroot National Forest comprises 1,600,000 acres (6,500 km²) of forest formed from a patchwork of public lands in the northwestern United States. The park straddles the border of west-central Montana and eastern Idaho, and contains 1,600 miles of trails. The forest is located in one of the largest and most rugged wilderness areas of the Northern Rocky Mountains - the Sapphire Mountains on the east side of the valley and Bitterroot Mountains on the west - with elevations ranging from 2,200 feet (650 m) along the Salmon River in Idaho to 10,157-foot (3,100-m) Trapper Peak. These peaks are drained by the Selway, Clearwater, and Bitterroot Rivers. Roughly half the forest 743,000 acres (3,010 km²) is included in three distinct wilderness areas, the Frank Church River of No Return, the Selway-Bitterroot, and the Anaconda Pintler Wilderness Areas. These make up the largest expanse of continuous pristine wilderness in the lower 48 states. Because of its size the wilderness areas provide a secluded habitat for a wide variety of mammals, including some rare, vulnerable species. Deer, elk, moose, black bears, and bighorn sheep make their home here. 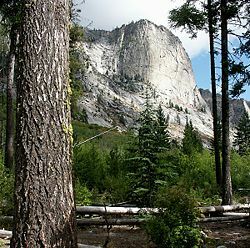 The forest is the ancestral home of the Bitterroot Salish Native Americans. The Nez Perce also frequented the area. The Nez Perce National Historic Trail passes through a portion of the forest. The first recorded Euro Americans to enter the area came with the Lewis and Clark Expedition. 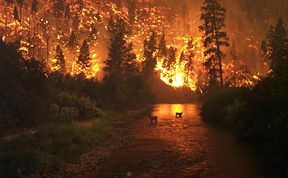 Wildfire in the forest as photographed on August 6, 2000. Bitterroot National Forest was established as a Forest Reserve on March 1, 1898 and attained the level of National Forest following the 1905 establishment of the National Forest Service. It has been expanded several times. Blodgett Canyon, Montana, looking west. View east near the mouth of Blodgett Canyon. Bitterroot National Forest comprised 1.6 million acres in west-central Montana and eastern Idaho. The forest headquarters is located in Hamilton, Montana. The largest nearby city is Missoula, Montana. U.S. Highway 93 passes through portions of the forest. Scenic Blodgett Canyon is but one of more than two dozen steep canyons deeply carved into the eastern flanks of the Bitterroot Range. Starting from a group of peaks at over 8,500 feet (2,590 m) along the Idaho/Montana border, the canyon steeply drops to Blodgett Lake at 6,800 feet (2,070 m). After running northeast for about a mile, it turns due east and descends for a total of about 12 miles (19 km) to the Bitterroot Valley. A trailhead is located at the mouth of the canyon, just west of the community of Hamilton. The vertical canyon walls in the lower section rise over 2,000 feet (610 m) above Blodgett Creek. Printz Ridge and Mill Point make up the northern wall, while Canyon Peak and Romney Ridge contribute to the southern wall. The upper (eastern) section of the canyon is part of the Selway-Bitterroot Wilderness Area. In the year 2000, the forest in the lower section of Blodgett Canyon was extensively burned. The canyons in this region were carved out by ice age glaciers, which left behind U-shaped valleys, moraines, hanging valleys, and steeply carved granite mountains, cliffs, and cirques, all of which are visible within Blodgett Canyon. In January 2008, the Bitterroot National Forest acquired 160 acres of land in the lower foothills near the mouth of Skalkaho canyon. The quarter section of land includes open hillsides interspersed with ponderosa pine stands. The primary attraction of this parcel is its value to wildlife; it supports blue and sage grouse, whitetail and mule deer, elk, and bighorn sheep. It also offers hiking, camping, picnicking, bike and horseback riding, and wildlife viewing and hunting opportunities for the public. The bitterroot flower, for which the forest is named. The forest is a combination of both grasslands and forested zones. Grazing rights are leased to private landowners in the lower elevations where grasses and shrublands are dominant. Higher up, Douglas fir, larch, and lodgepole pine slowly give way to Engelmann spruce and whitebark pine as the altitude increases. Above the treeline at 8,000 feet (2,400 m) the trees abruptly end and alpine flowers and grasses are found. 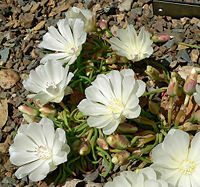 The bitterroot (Lewisia rediviva) for which the forest is named is a small, low, pink flower with a yellow center. It is the state flower of Montana. The plant is a low-growing perennial plant. A single flower appears on each stem, ranging in color from whitish to deep pink or rose, during May and June. The roots were consumed by local Native American tribes such as the Shoshone and the Flathead Indians as an infrequent delicacy. Three major geographic features, the Bitterroot Mountains (running north-south and forming the divide between Idaho and Montana), the Bitterroot Valley, and the Bitterroot River (which flows south-north, terminating in the Clark Fork river in the city of Missoula), owe the origins of their names to this flower. The Lemhi Shoshone believed the small red core found in the upper taproot had special powers, notably being able to stop a bear attack. Mountain goats make their home in Bitterroot National Forest. The Frank Church-River of No Return Wilderness Area is inhabited by a large population of mountain lions, and grey wolves visit the area. Populations of black bears, as well as lynx, coyote, and red fox are scattered throughout the area. Other observable ruminant wildlife include bighorn sheep, mountain goats, elk, moose, mule and white tail deer. The wilderness also offers some of the most critical habitat for wolverines in the lower 48 states. There are 1,600 miles (2,500 km) of trails and 18 improved campgrounds within the forest. Outstanding fishing is found in the dozens of rivers, streams, and lakes. Other water activities that can be enjoyed are boating, rafting, and water-skiing. Lake Como, constructed in 1905 to provide late-season irrigation for the Bitterroot Valley, provides a beach for swimming. Winter recreation includes downhill and cross-country skiing, snowmobiling, and snowshoeing. 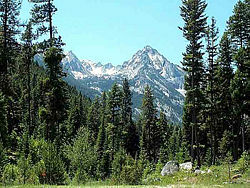 Trapper Peak is the highest point in the Bitterroot Mountains. It rises over 6,000 feet (1,830 m) above the nearby Bitterroot Valley. A trail to the peak climbs 3,800 feet (1,160 m) from the end of a Forest Service road. Bitterroot Salish men, original occupants of the land that became Bitterroot National Forest. Image 1903. The Bitterroot Salish, Upper Pend d’Oreille, and the Kootenai lived in the region. 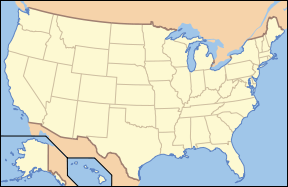 The territories of these three tribes covered all of western Montana and extended into parts of Idaho, British Columbia, and Wyoming. The Lewis and Clark Expedition passed through parts of what are now forest lands in 1805. After the discovery of gold in Idaho and then Montana in the 1860s, numerous mining towns were built, some of which today are ghost towns. The Nez Perce National Historic Trail passes through a portion of the forest. The trail traverses portions of the U.S. states of Oregon, Idaho, Wyoming, and Montana and connects 38 separate sites across these four states that commemorate significant events that occurred to the Nez Perce during their attempt in 1877 to escape capture by the U.S. Cavalry, which was under orders to move the Indians onto a reservation. Heavy logging and other resource depletion beginning in the 1880s led conservationists to push for preservation of the forest. The Bitter Root Forest Reserve was established by the General Land Office on March 1, 1898, with 4,147,200 acres (16,783 km²). It was transferred to the Forest Service in 1906. On July 1, 1908, the name was changed to Bitterroot National Forest, with lands added from Big Hole National Forest and Hell Gate National Forest. Other lands were transferred from Bitterroot to Beaverhead, Clearwater, Nez Perce and Salmon National Forests. 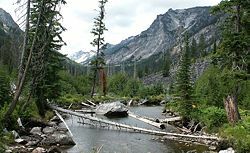 On October 29, 1934, part of Selway National Forest was added. Many of the Bitterroot National Forest’s developed recreation facilities were built 30 or more years ago. Since then, visitor preferences and demographics have changed. Some sites no longer serve projected demand; some facilities are in poor shape and do not meet visitors' expectations. To respond to these conditions and national direction, the forest is implementing the Recreation Site Facility Master Planning (RSFMP) process for developed recreation sites. The result is a program of work with a list of prioritized actions to more effectively manage these recreation sites. "All of the developed recreation sites on the Bitterroot are proposed for continued operation," stated Sue Heald, Forest Recreation Staff Officer. "However, considering the increases we are seeing in use coupled with the decline we are experiencing in our operating budgets, we cannot continue to manage all sites at the same level we have in the past. Possible scenarios we have looked at include implementing shorter operating seasons, reducing the services provided such as drinking water or picnic tables, or seeking partners and volunteers to help maintain sites." Part of the planning process is to consider recreation fees to help manage public needs. A minimum of 80 percent of recreation fees collected on forest land are invested back into the Bitterroot’s fee sites. ↑ U.S. Fish and Wildlife Service. November 16, 2000. Record of Decision and Final Rule for Grizzly Bear Recovery in the Bitterroot Retrieved January 8, 2009. ↑ Richard C. Davis. September 29, 2005. The National Forests of the United States Forest History Society. Retrieved January 8, 2009. ↑ USDA Forest Service. January 11, 2007. Bitterroot National Forest News Release Retrieved January 8, 2009. USDA Forest Service. Bitterroot National Forest Retrieved January 8, 2009. History of "Bitterroot National Forest"
This page was last modified on 10 June 2016, at 18:44.